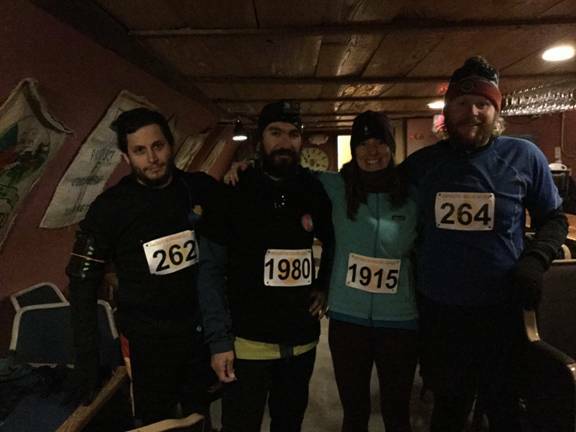 Pre-race photo of (L to R) Scott, Ioannis, Juliane, James, taken in the warmth of the Coffee House adjacent to the start/finish line. Juliane leaves the chasing horde in her dust as she triumphantly crosses the finish line (photo credit McMurdo Rec.). View of the Polar Star from the bridge onto the ice pier. View aft the Polar Star with the inbound science vessel on the left, Discovery Hut on the right, and the crushed ice in the foreground. With the green fog lifted, that cartoon-like haze of smell we all know you’re imagining surrounding us as we arrived in McMurdo, we’ve been getting things clean (real clean, not field clean) and organized to round out the field season. Gear and even half our skidoos are in the process of arriving from Shackleton, keeping us busy over the past few days with more work ahead. This morning specifically included looking after the majority of our tents. Turns out, James and Scott’s tent is going to need another couple of days to de-ice – guess they weren’t the “hot stuff” the rest of the team were. But, all work and no play makes Ioannis a dull boy. (We joke, best we stop picking on James, just this once.) With our time between duties, we’ve been keeping busy. Four of us ran a 5k with “The Coasties”. “Coasties” are a group of globetrotting sailors with impeccable fashion sense, laying siege to frozen ice with their Polar Star ship from pole to pole. 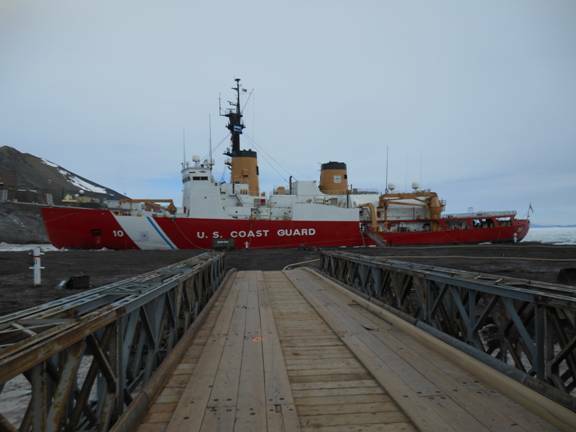 Joking aside, the US Coastguard Polar Star is the ice breaker that just arrived 2 days ago, clearing a channel through the sea ice to facilitate the arrival of the research/science vessel, the cargo vessel, and the fuel vessel, which supply McMurdo for the winter season. The Polar Star is an impressive ship and we got the privilege to tour it. On board feels like a labyrinth, with small hallways and cramped rooms, the bridge is the biggest space. 150 crewmen and crewwomen are on board to operate and maintain the ship – one of the final ships built by Lockheed’s ship division (in 1972). The vessel has 3 propeller shafts, driven by diesel engines when cruising, and turbines when breaking through thick (6 foot) ice at 3 knots. 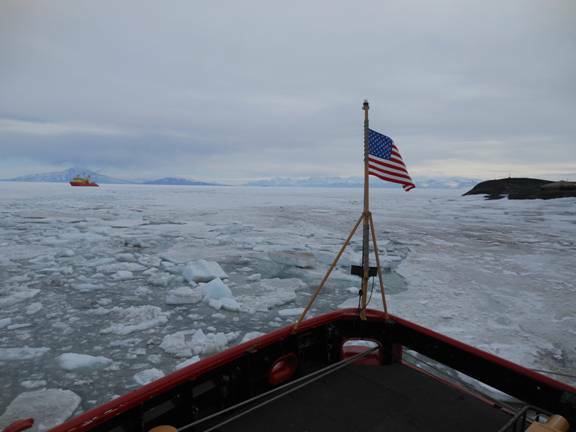 The vessel is fueled by over 1.5 million gallons of diesel fuel which would more than last a round trip from Seattle (its home base) to McMurdo. Today the Polar Star left and made way for the science vessel that just docked a few hours ago. The cargo vessel is due Jan. 25th. 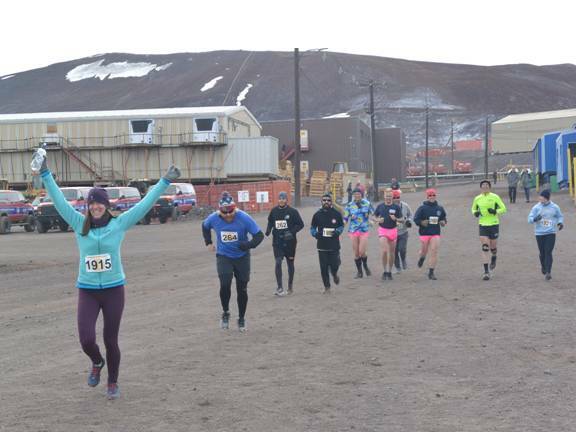 In honour of the coastguard visit, McMurdo hosted a series of Coastie-themed events, including a 5K race. Four of us (Ioannis, James, Juliane, Scott) participated alongside other residents of McMurdo and several well-dressed Coasties. The route took us through town and up that dreaded hill towards Scott Base. At the conclusion of the race, Juliane was at the front with a pack close on her heels. As you can see in the photo, the Coasties were in their exquisite pink short-shorts. To put your mind at ease, no, we were not running from snow yetis – it is high summer here, they’ve all left town. On a more-serious note, we heard that there appears to be a US government shutdown looming. We have been updated on the situation by the NSF representative in town as it will affect us. The main point is, we’re not going to be stuck here, it’ll be business as usual until April/May for McMurdo. So, lucky for most of you back home, your staycation away from us ANSMET folks will likely not end early as a result. Posted by Juliane and Scott from McMurdo on 2018-01-20 at 14:45 local.